Little is known about the Buddha's early life. No biography was written during his lifetime. Only isolated events from his life before he attained enlightenment were preserved. Some of the following are probably mythical in nature. Traditional belief is that he was born a prince in Lumbinī, Nepal in the Terai lowlands near the foothills of the Himalayas. However, considerable archeological evidence now shows that he may have been born in Kalinga -- now Orissa in India. 7 He was a member of the Śakyas clan. His father, Suddhodana, was king of the clan. His mother was named Maya. There is no consensus on the date of his birth. Modern Buddhists of the Theravada tradition suggest he was born in 623 or 624 BCE. Until recently, many religious historians have preferred birth dates ranging from 567 to 487 BCE. Various modern scholars have suggested dates from 420 to 502 BCE. In short, nobody really knows. In common with many other great religious leaders, many miraculous stories were associated with his birth. He emerged from his mother's side without causing her any pain. The earth shook as he was born. As a newborn, he was miraculously showered with water. He stood up, took seven steps, announced that he would be the "chief of the world." He also stated that this would be his last reincarnation. He was given the name Siddhartha Gautama. Siddhartha means "one who has achieved his aim." Gautama was his clan name. He was sometimes referred to as Śakyamuni which means "the sage of the Śakyas." He may have been born into the second of the four Indian castes -- the aristocratic warrior caste called Kşatriyas. Śakyamuni was raised as a Hindu. His parents assumed that he would succeed his father as king later in his life. His parents were concerned about a prophecy that astrologers gave at the time of his birth. They predicted that he would become either a universal monarch or a monk who would be a great religious teacher. His parents raised him in a state of luxury in the hope that he would become attached to earthly things and to pleasure. This would make it less likely that he choose the religious life. At the age of 16, he was married to his wife Yaśodhara. When he was 29, his wife had a son, Rahula. Shortly after his son's birth, some sources say that he took four journeys by chariot. Other sources say he had four visions. During the first trip/vision he was deeply disturbed by seeing an elderly, helpless, frail man. On the second, he saw an emaciated and depressed man suffering from an advanced disease. On the third, he spotted a grieving family carrying the corpse of one of their family to a cremation site. He reflected deeply upon the suffering brought about by old age, illness and death. On his fourth trip/vision, he saw a religious mendicant -- a śramaņa -- who led a reclusive life of meditation, and was calm and serene. The four encounters motivated him to follow the path of the mendicant and find a spiritual solution to the problems brought about by human suffering. He left his wife, child, luxurious lifestyle, and future role as a leader of his people in order to seek truth. It was an accepted practice at the time for some men to leave their family and lead the life of an ascetic. His wife Yaśodhara was about 29 years-of-age when the Buddha left her and their son. She supported her husband's decision to leave the family and seek enlightenment. He first tried meditation, which he learned from two teachers. He felt that these were valuable skills. However, meditation could not be extended forever, He eventually had to return to normal waking consciousness and face the unsolved problems relating to birth, sickness, old age and death. He then joined a group of similarly-minded students of Brahmanism in a forest where he practiced breath control and fasted intensely for six years. He is said to have brought himself to the brink of death by only eating a few grains of rice each day. Some sources say that he consumed only a spoonful of bean soup per day. This technique produced a series of physical discomforts. Ultimately, he rejected this path as well. He realized that neither the extremes of the mortification of the flesh nor of hedonism would lead to enlightenment. He determined that a better path to achieve the state of Nirvana -- a state of liberation and freedom from suffering -- was to pursue a "Middle Way." This way was largely defined by moderation and meditation. During the first watch of the night, he developed the ability to recall the events of his previous reincarnations in detail. During the second watch, he was able to see how the good and bad deeds that many living entities performed during their lifetimes led to the nature of their subsequent reincarnation into their next life. During the third watch, he learned that he had progressed beyond "spiritual defilements," craving, desire, hatred, hunger, thirst, exhaustion, fear, doubt, and delusions. He had attained nirvana. He would never again be reincarnated into a future life. The events under the Bodhi tree are often described in mythological terms in Buddhist literature and art. His experiences are portrayed as a battle with Mara, the Buddhist equivalent of the Judeo-Christian-Islamic Satan. He assumed the title Lord Buddha (one who has awakened; the one who has attained enlightenment by himself). For seven days, he puzzled over his future: whether to withdraw from the world and live a life of seclusion, or whether to reenter the world and teach his Middle Way. He decided on the latter course: to proclaim his Dharma (teachings) to other humans so that they could also attain enlightenment. He located five of his fellow seekers with whom he had earlier fasted, and rejoined them near Benares. They quickly became aware of the changes brought about by his enlightenment. It was to them that he preached his first sermon. It contained the essential teachings of Buddhism. All five accepted his teachings and were ordained as monks. After the Buddha's second sermon, all five achieved enlightenment. They are referred to as Arhants (saints). He wandered around Northeast India for decades, teaching all who would listen. He covered a "territory some 150 miles long by 250 miles wide, an area somewhat smaller than Ireland or the state of Pennsylvania." 2 He had tens of thousands of disciples and accumulated a large public following. He later established an order of monks and a corresponding order of nuns. "Yasodhara entered the order of monks and nuns and within a short time attained Arahantship." "Arahantship" is a term used to refer to individuals who are either far advanced along the path of Enlightenment, or who have actually attained nirvana. His health began to fail when he was in this late 70s. After forty-five years of teaching, he died in a small town named Kuśinagara, at the age of 80, apparently of natural causes. His wife pre-deceased him by two years. His final words were: "Decay is inherent in all things. Be sure to strive with clarity of mind" for Nirvana. The traditional date of his death used by Theravadin Buddhists is 544 or 543 BCE. However, other dates have been suggested from 544 to 380 BCE. He did not choose a successor. He felt that the Dharma -- his teachings -- plus the Vinaya -- his code of rules for the monks and nuns -- would be a sufficient guide. Two and a half centuries later, a council of Buddhist monks collected his teachings and the oral traditions of the faith into written form, called the Tripitaka. This included a very large collection of commentaries and traditions; most are called Sutras (discourses). Many Westerners confuse Budai with Gautama Buddha, the founder of Buddhism. 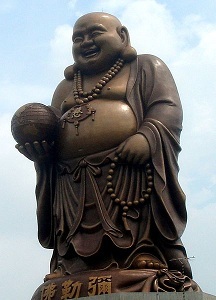 Images of Budai are often referred to as "Fat Buddha" and "Happy Buddha." However, Gautama Buddha is generally portrayed as tall and slender. "Gandhara, Pakistan," Biblical Archaeology Review, 2004-MAY/JUN, Page 64. A statue of Budai in Emei, Hsinchu, Taiwan.